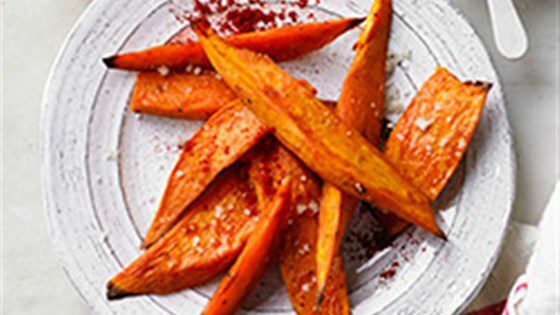 These baked sweet potato wedges LOOK like their fried cousin, but they’re oh so much healthier. Serve alongside ketchup if you must! 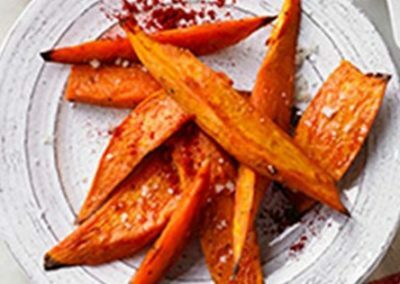 2-3 large sweet potatoes, peeled, cut into 1x3-inch wedges 3 TBSP extra virgin olive oil 1/2 tsp sea salt 1/2 tsp freshly ground black pepper 1/4 tsp paprika 1/4 tsp garlic powder Position rack in upper third of oven and preheat oven to 425 degrees F. Spray baking sheet with non-stick spray. Place sweet potatoes and oil in large bowl, toss lightly. Sprinkle with salt, pepper and paprika. Arrange potatoes in a single layer on prepared baking sheet, being sure not to overcrowd. Bake until tender and golden brown, turning occasionally. Cooking time is 18 to 24 minutes. Cool 5 minutes before serving.